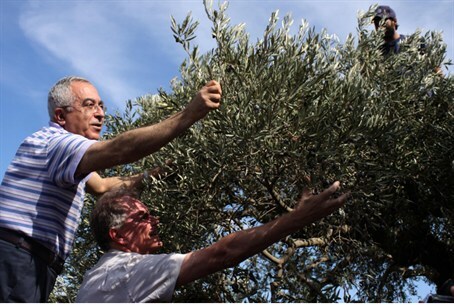 Catherine Ashton joins PA olive harvest in Israeli territory. PA: This proves the land should be ours. European Union foreign policy chief Catherine Ashton joined an Arab olive harvest on Thursday. Ashton picked olives in the town of Ras Karkar in the Binyamin region. Ras Karkar is part of Area C, the Judea and Samaria territory that is under Israeli military and administrative control according to Israel-PA agreements. PA Prime Minister Salad Fayyad said Ashton’s visit gives support to his efforts to end Israeli presence in the area. “Ashton’s visit here is testimony to this territory is not contested as Israel claims,” he argued. “Maybe the visit will help us move to full Palestinian sovereignty” in the town, local residents said. During her visit Ashton told the residents that the EU believes in a “two-state solution” that would see Judea and Samaria become another Arab state. She praised Fayyad for his efforts to establish PA institutions. Ashton also met with PA Chairman Mahmoud Abbas to discuss his bid to upgrade the PA’s status at the United Nations. Abbas plans to ask the General Assembly to change the PA’s “observer entity” status to “observer state,” thus recognizing the PA as a country.